Also Called: King ranch bluestem, kr bluestem, turkestan bluestem. Culms: Slender, solid, sometimes decumbent at base, grooved on one side, glabrous to short-hairy at nodes. Blades: Flat to folded or rolled under, 1/2 to 9 inches long, less than 1/5 inch wide, midrib prominent, rough to thinly hairy, particularly on upper surface near collar. Sheaths: Longer than internodes, slightly keeled, glabrous. Inflorescences: Panicle, digitate (like fingers on a hand), purplish, terminal; inflorescence axis shorter than branches,; branches 2-8, each .8 to 2.8 inches long; rachis and pedicels fringed with silky hairs. Spikelets: In pairs; one sessile and perfect; one stalked, as large or slightly larger, sterile; awns of fertile lemmas twisted, bent, .4 to .6 inch long. Habitat: Waste ground, roadsides, and pastures; fine-textured, calcareous soils. Origin: Probably introduced from China to the California Agricultural Experiment Station around 1917. First gained notice in 1937 on the King Ranch in Texas, and thus the common name King Ranch bluestem. 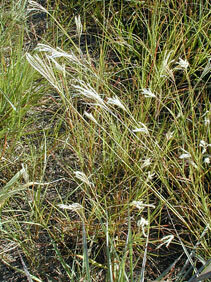 Forage Value: Livestock will consume plains bluestem during its early growth stages. Uses: Plains bluestem has been used for pasture, hay and soil conservation purposes such as bank stabilization. Comments: Is very susceptible to leaf rust, which will cause the leaves to wilt and turn a rust color. Plains bluestem is a weedy grass than can crowd out more desirable species.